Software seamlessly converts existing Mazak programs for use in the new Mazak SMART CNCs, in addition to Matrix and other generations SolutionWare Corp has announced the release of “MazaCAM Smart Edition,” the newest version of SolutionWare’s MazaCAM CNC programming system. MazaCAM Smart Edition is the first and only CNC programming system to support the entire range of generations from Mazak’s first T1 model to the new Mazatrol SMART lathes and controls. MazaCAM Smart Edition also supports all standard G-code CNC controls. Shops can now have one system for programming all their CNCs instead of different methods and systems for each kind of machine. According to Mazak Corporation, Mazak's new QUICK TURN SMART series of lathes and controls can be programmed up to 75% faster than machines equipped with EIA/ISO systems. SolutionWare’s MazaCAM Smart Edition helps users leverage that efficiency even more by converting between control generations, programming Mazatrol on the computer, converting CAD-files such as IGES and DXF to Mazatrol, and checking the program before it goes out to the shop floor — along with tool-management and other time-saving benefits. In addition, MazaCAM Smart Edition can program any machine that uses industry-standard G-code. Converting to the new SMART Generation from Legacy controls A major benefit of the new MazaCAM Smart Edition is the ability to convert legacy Mazak programs to the new SMART controls and lathes. Easier network communications, to send/receive files over the Ethernet directly to the CNC. Enhanced conversion between generations of Integrex machines, including the tilting-tool B-axis. Enhanced conversion between controls regarding Priority-Numbers. Improved conversion of Manual-Process, now users can convert all the way from T1 to the Matrix and the new Smart control in a single command. Even more enhancements on converting between Matrix and other generations. 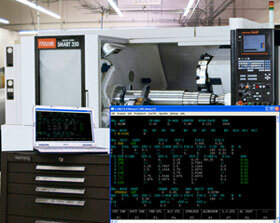 More live-tooling support for multi-tasking mill-turn lathes. More open integration so other systems can access the functions within MazaCAM and thus provide the user with a more seamless experience. About SolutionWare Corporation: For more than 34 years SolutionWare Corporation has been continuously advancing software and training that gives CNC shops the flexibility to utilize all their CNC equipment for the greater productivity of their shop.